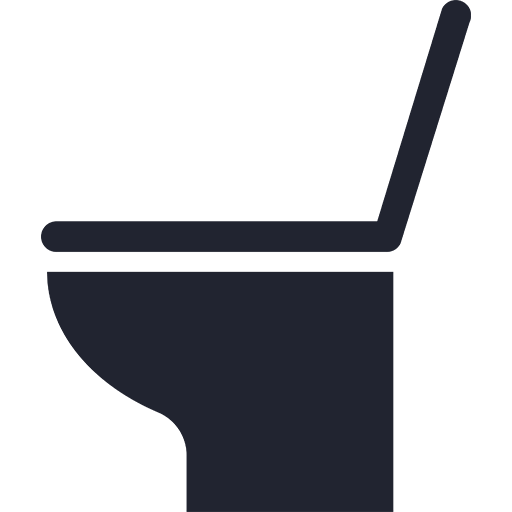 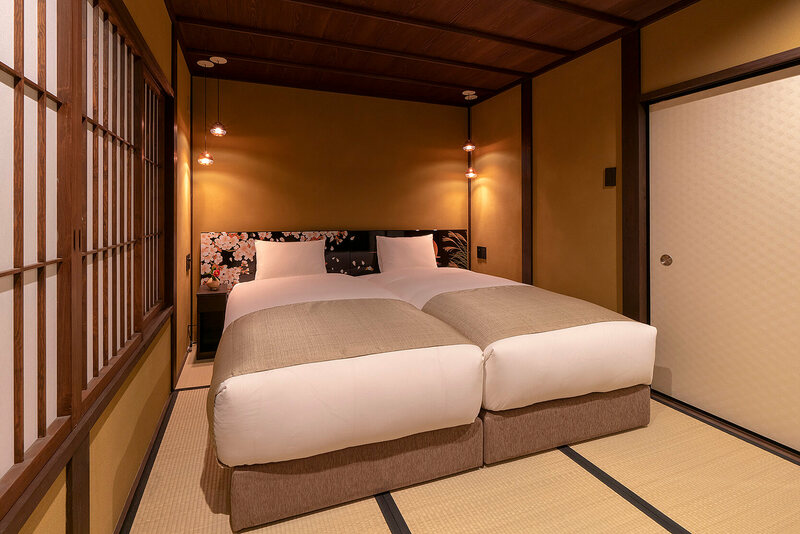 Rates will vary depending on season, date, and number of guests. 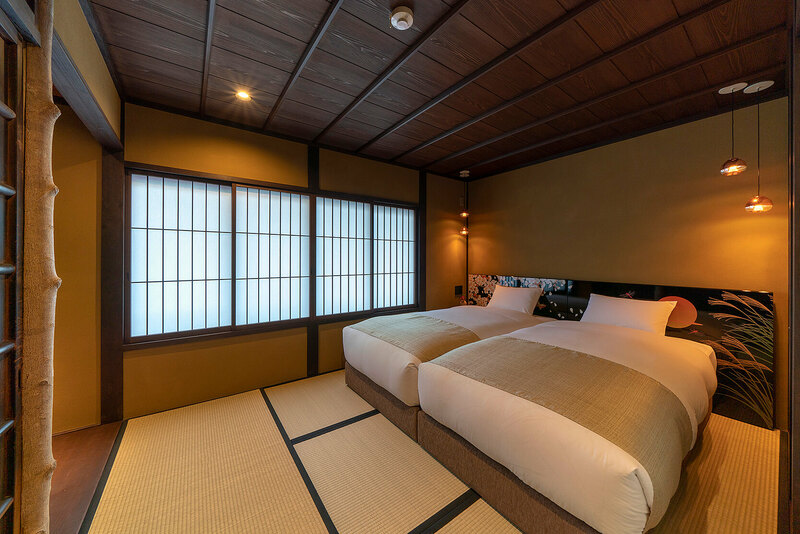 Children 5 years of age and under, who do not require bedding, do not need to be included within the total number of guests. 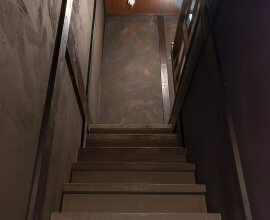 Embellished in bronze, copper and silver. 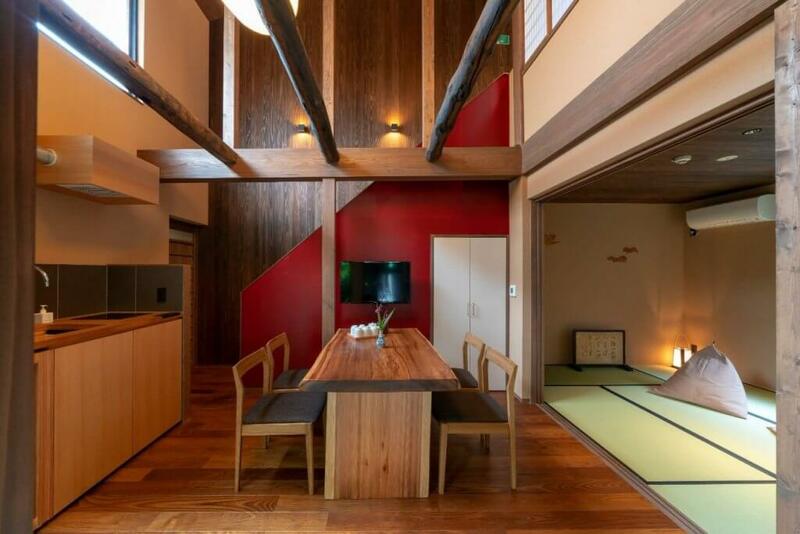 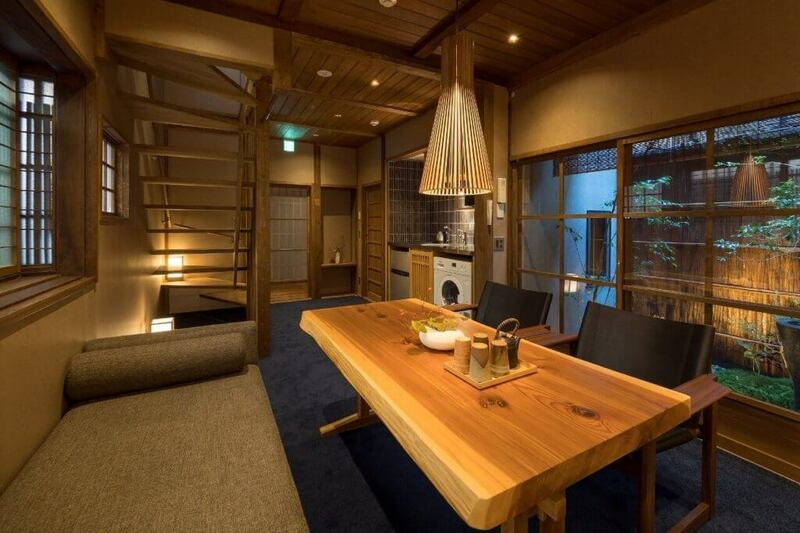 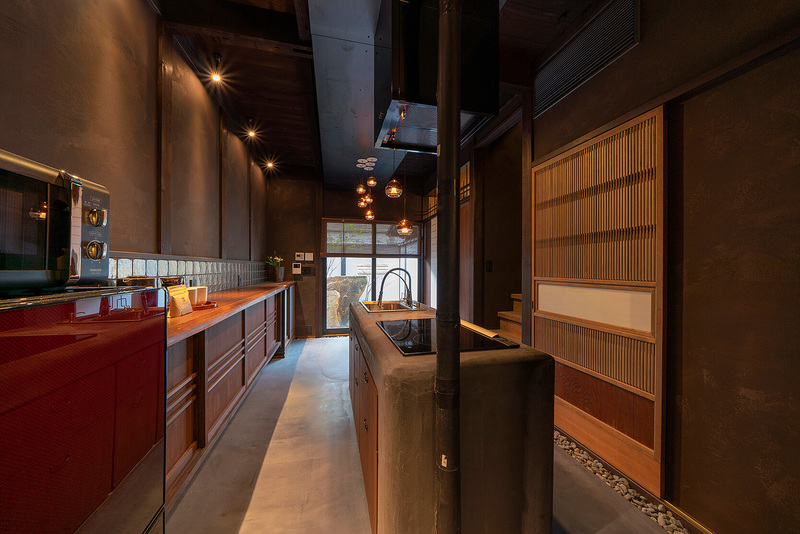 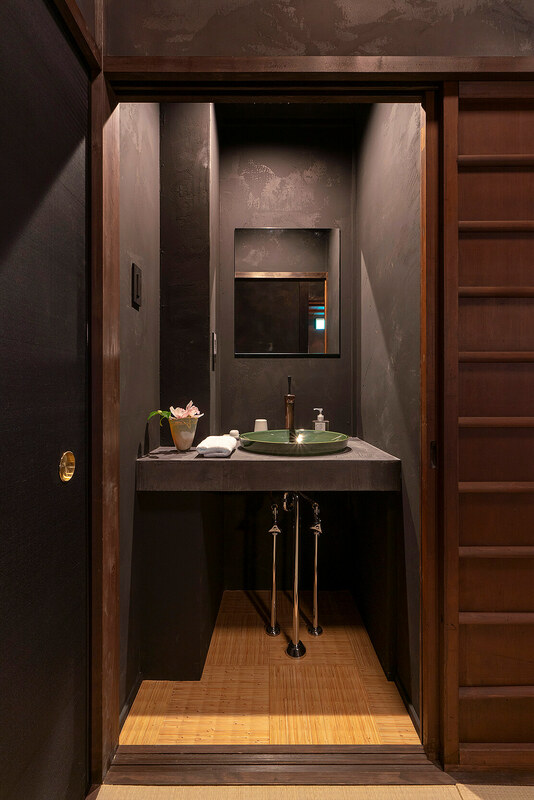 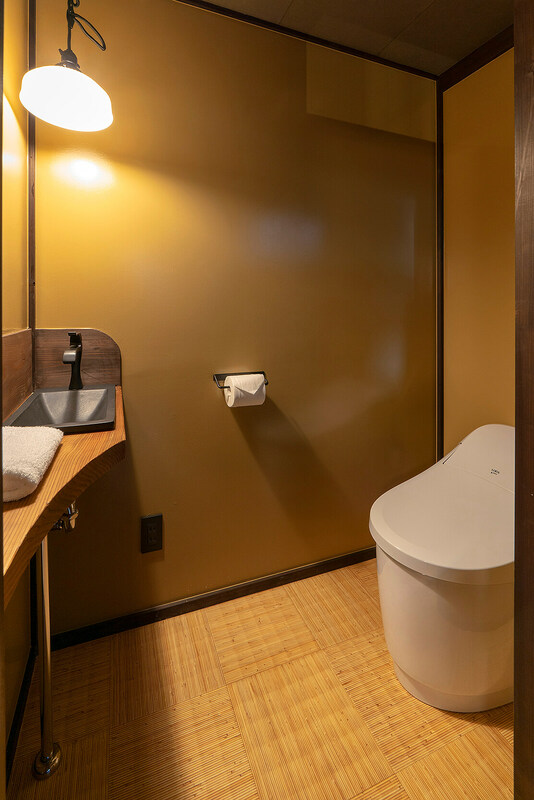 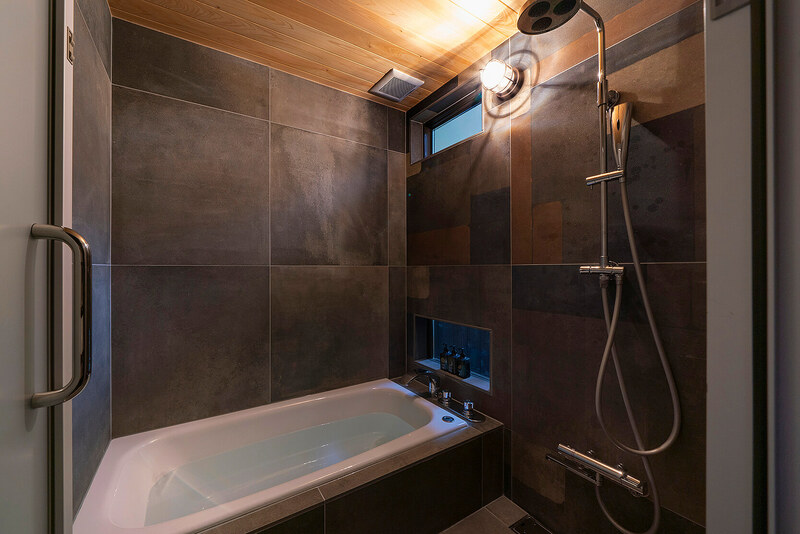 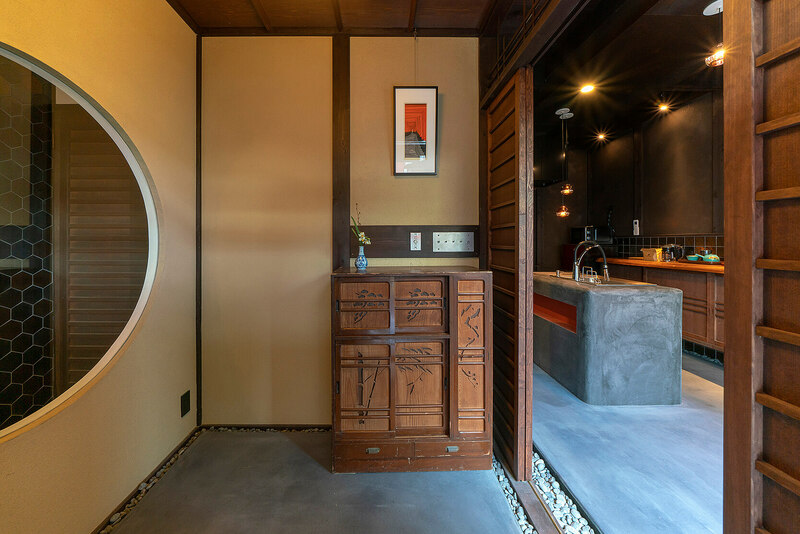 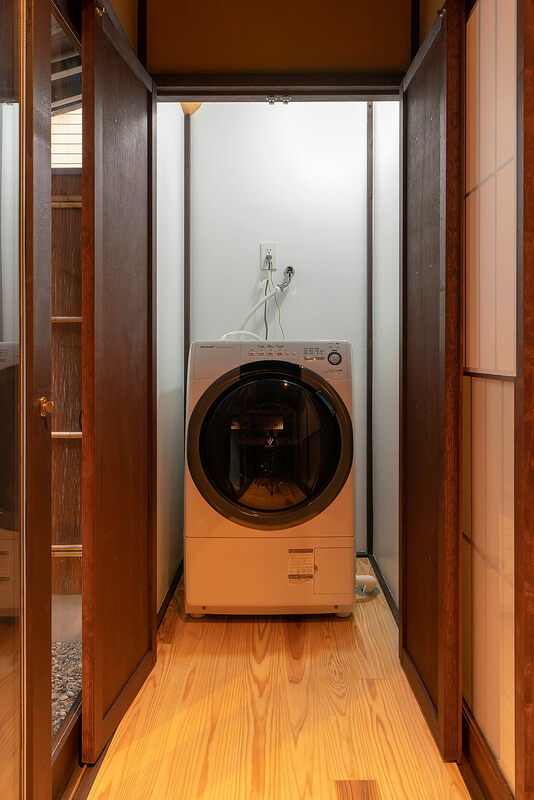 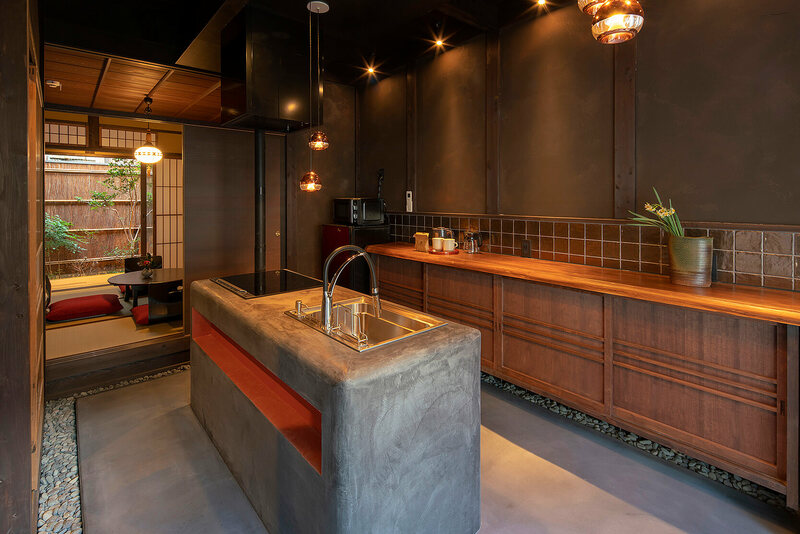 A traditional machiya that re-imagines rustic materials in a gorgeous, modern design. 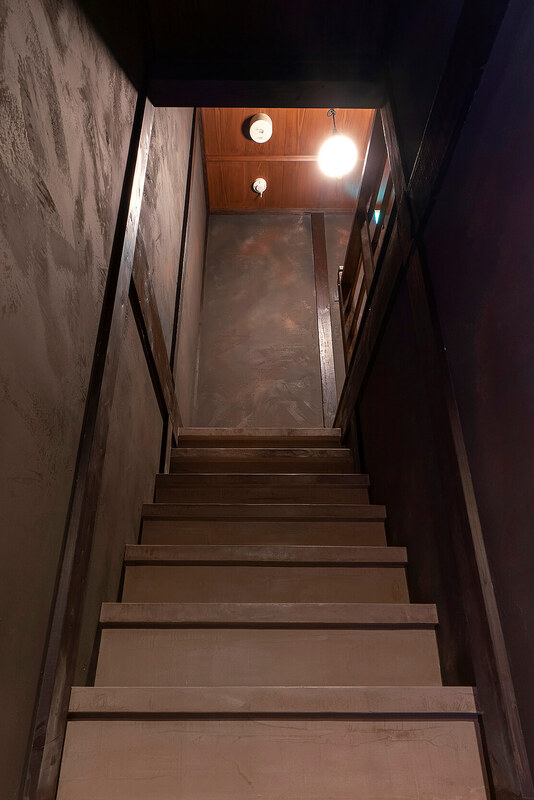 Like warm rust colours and polished metals, marvel at this sophisticated space refined by time and history.  Surround yourself in the warmth and boldness of “Shakudo-an”. 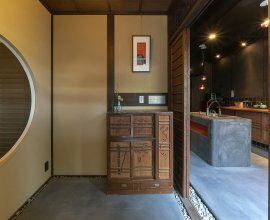 Bold metallics and traditional design Enter to see a modern interpretation of the circular window typically found in tea ceremony rooms. 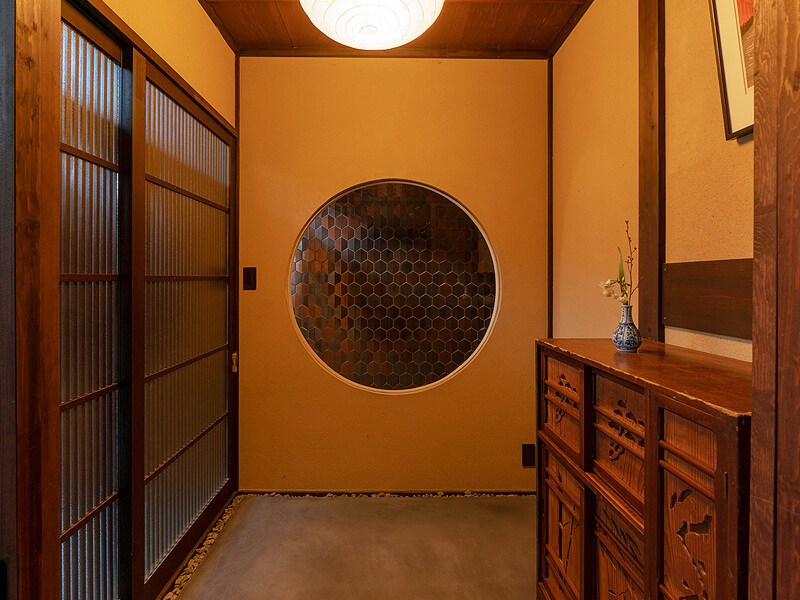 The round shape frames and softens the silver and bronze tilework. 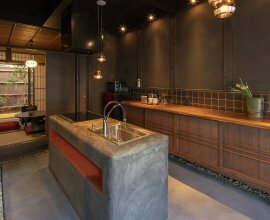 Exquisite kitchen Find sleek copper lighting over a kitchen island based on the traditional ‘okudo’ stone hearth. 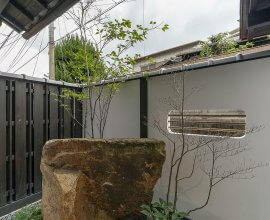 A stone border inspired by Zen gardens invites serenity into the space. 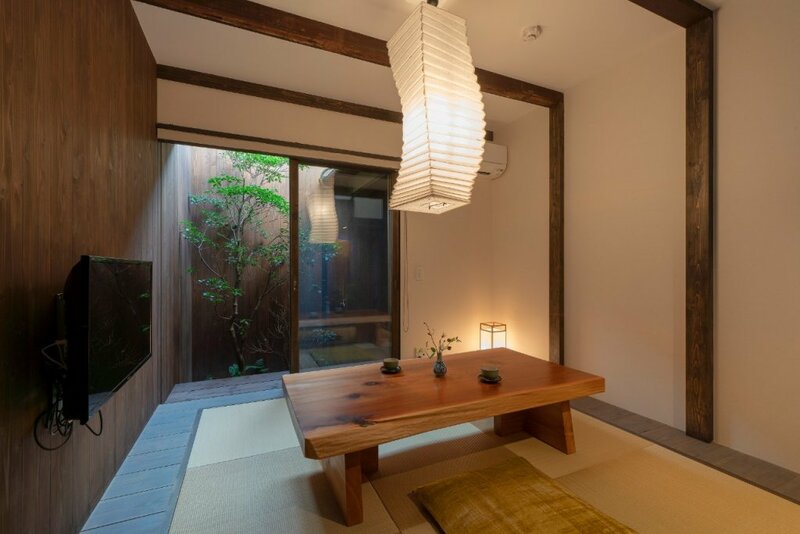 Japanese living room Appreciate delicate design elements here. 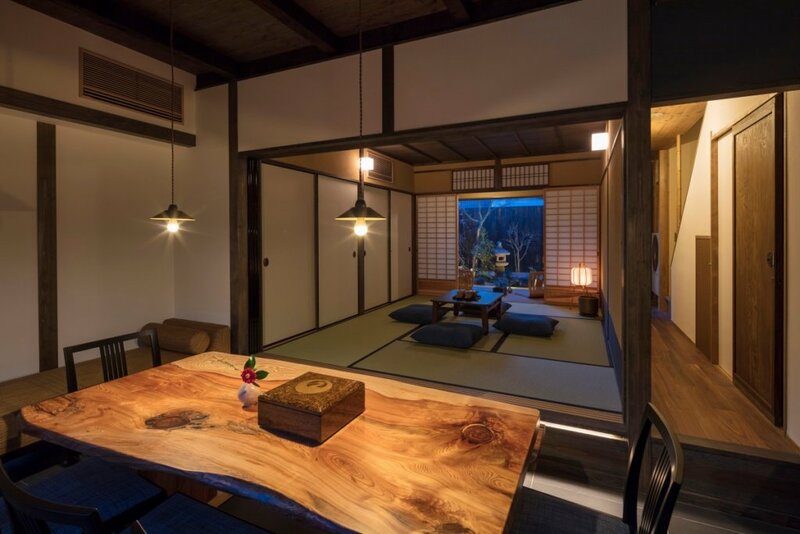 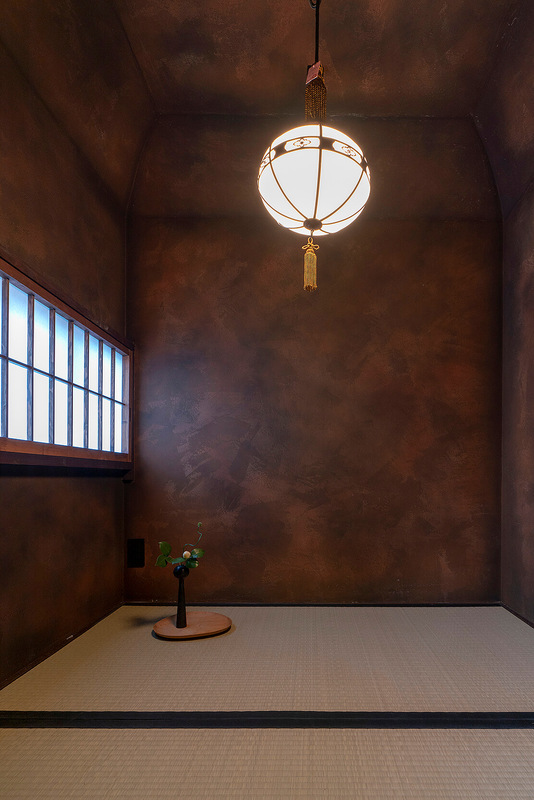 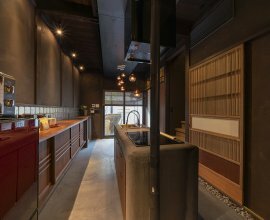 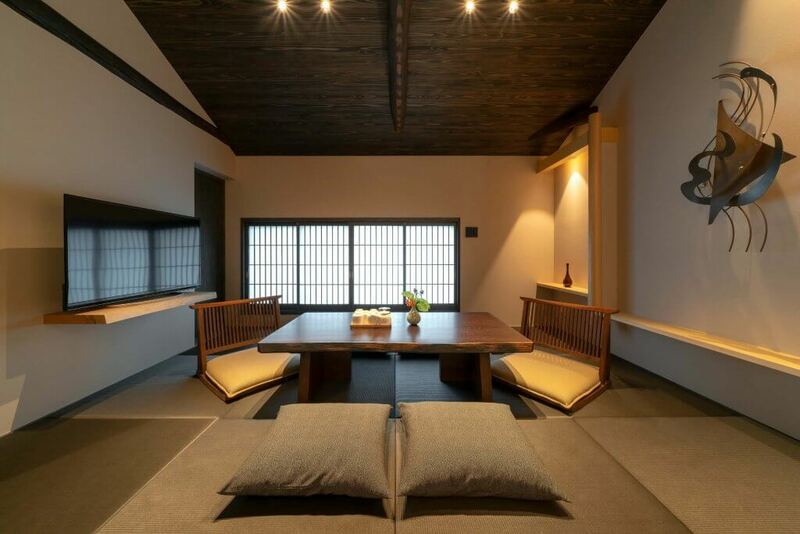 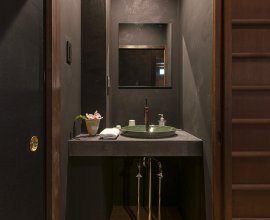 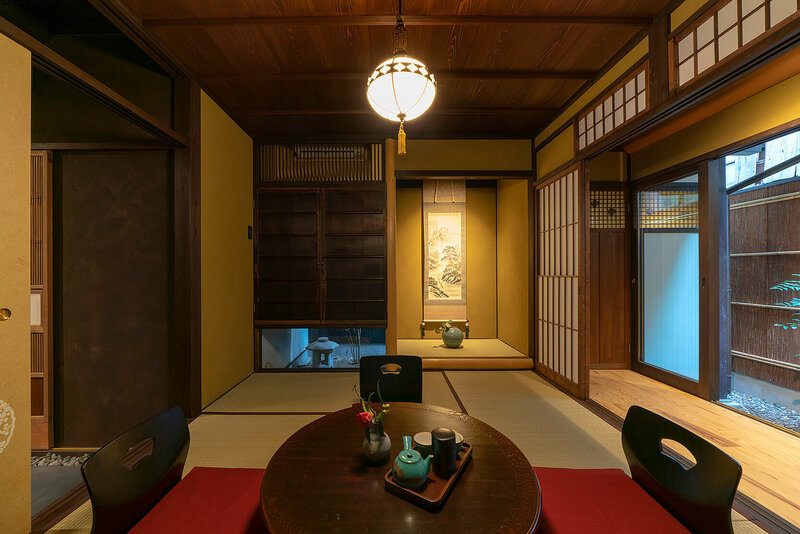 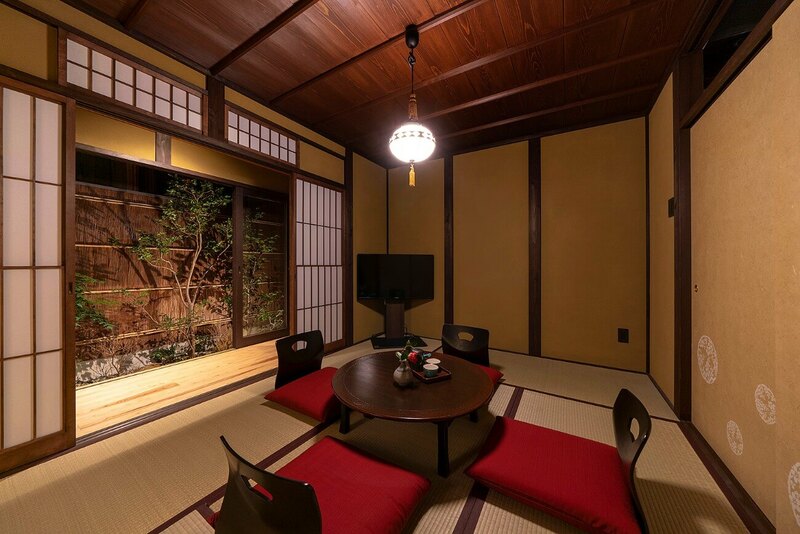 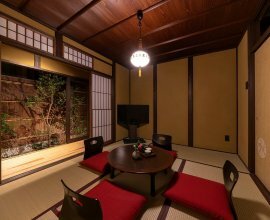 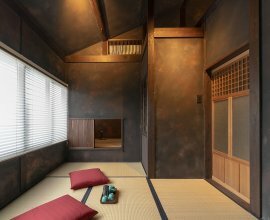 ‘Shoji’ sliding doors, braided wooden ceiling and a ‘tokonoma’ art display space are all features of a traditional tea ceremony room. 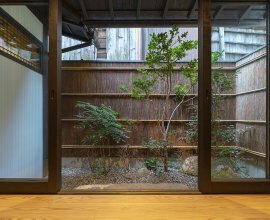 Three gardens Enjoy a garden view from anywhere on the first floor. 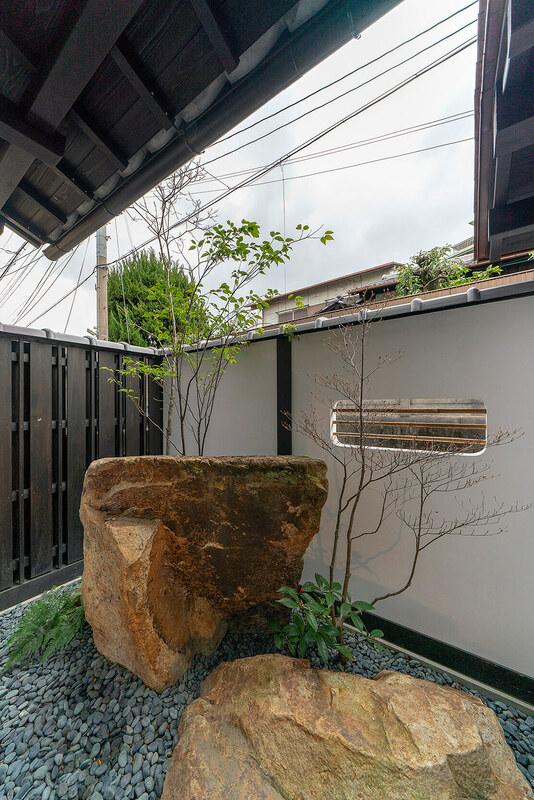 In the front, find a beautiful stone arrangement. 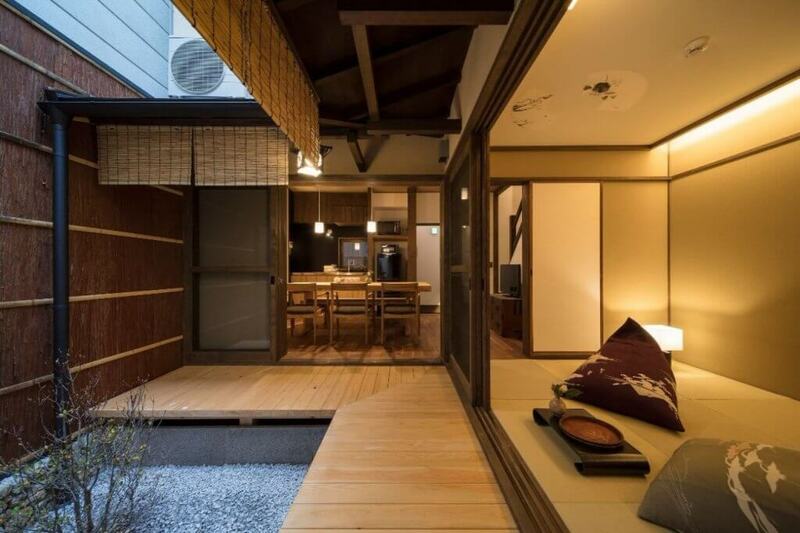 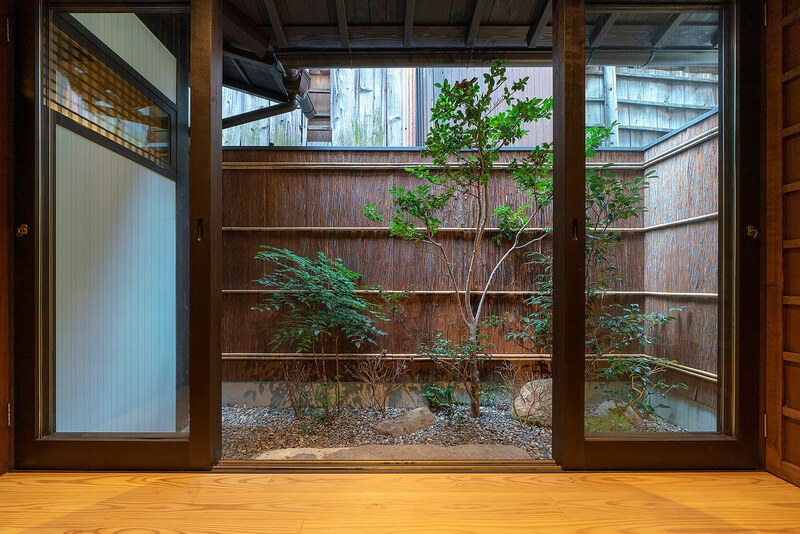 In the back, bask by the fresh garden from the veranda or Japanese living room. 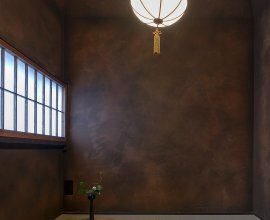 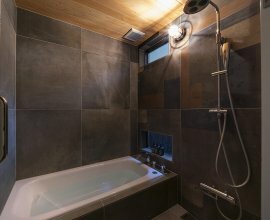 A soothing space to rest A ‘tokonoma’ with a wispy metallic art and copper lighting are found here. 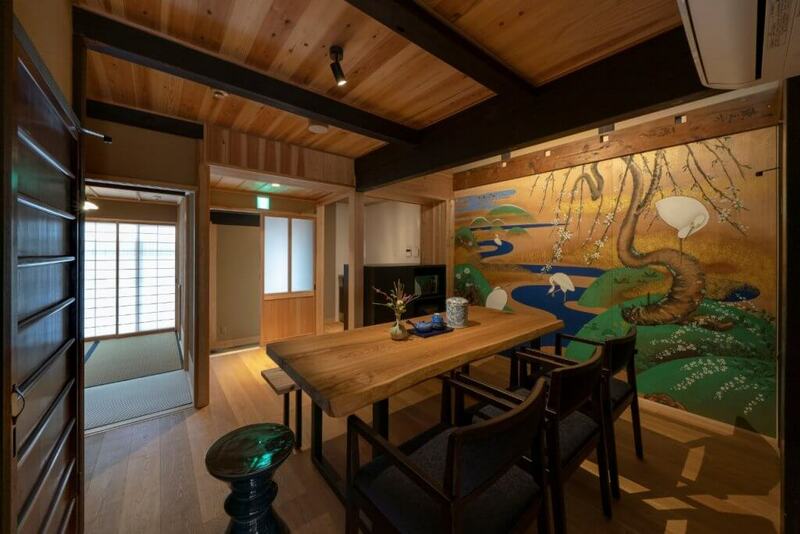 Rich woodwork and the wooden ceiling envelope the room in warmth. 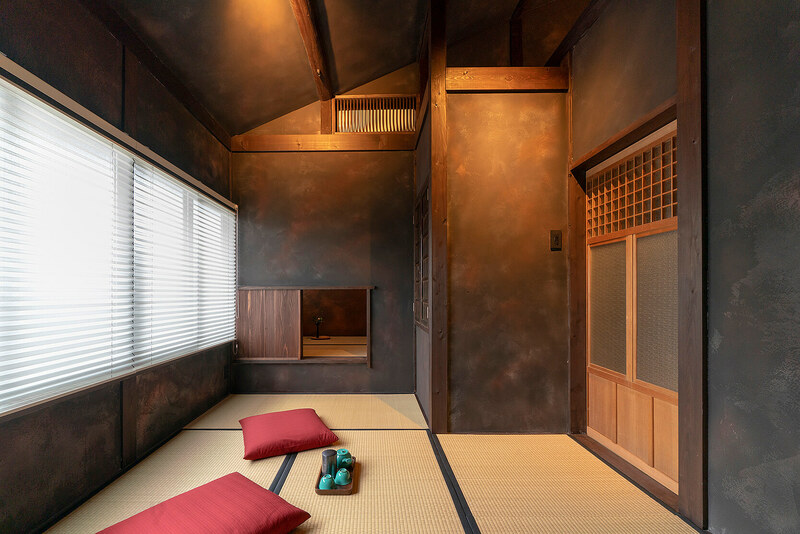 Retreat to this playful bedroom Notice the open architecture of the high ceilings. 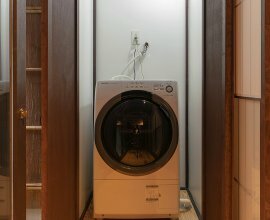 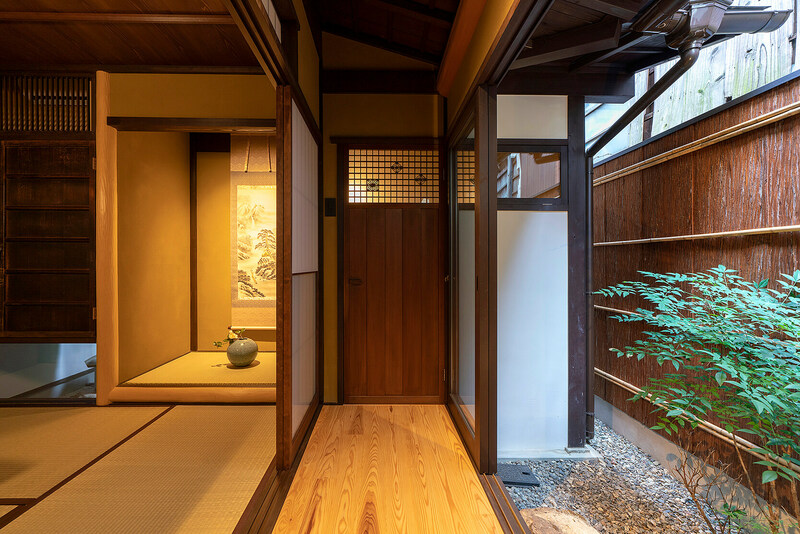 Slide open the window in the wall to find an entrance way into the tea ceremony room. 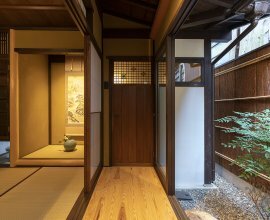 From “Shakudo-an”, a 7-minute walk brings you to Sanjusangendo Temple, Japan’s longest wooden structure that famously houses 1,001 bronze statues of Kannon. 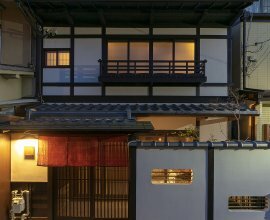 Stroll along Sannenzaka, one of Kyoto’s most atmospheric streets - just 10-minutes from home on foot. 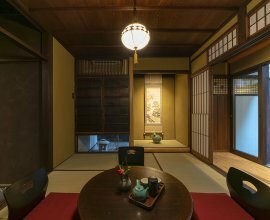 Take in the feeling of Old Japan as you peruse shops specializing in Kiyomizu ceramics, matcha sweets and traditional kimono textiles. 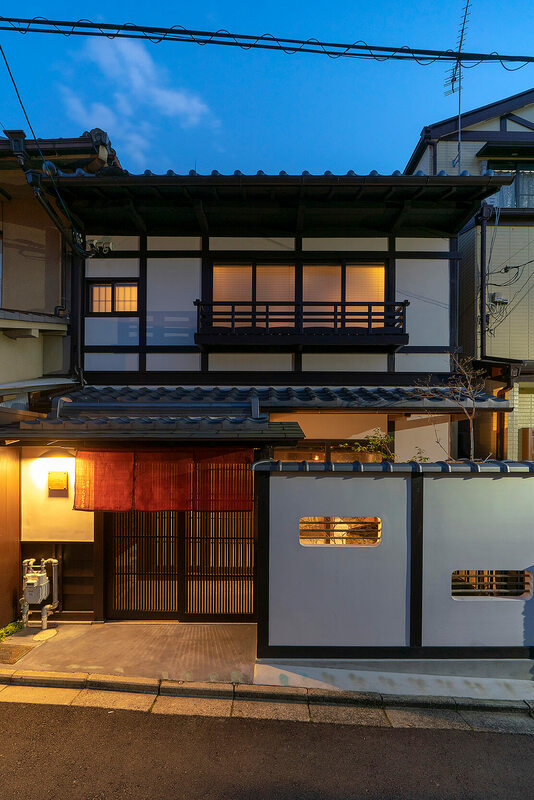 Wander the slopes of Higashiyama leading up to Kiyomizudera Temple, the renowned UNESCO world heritage site, a mere 13-minute walk north of “Shakudo-an”. 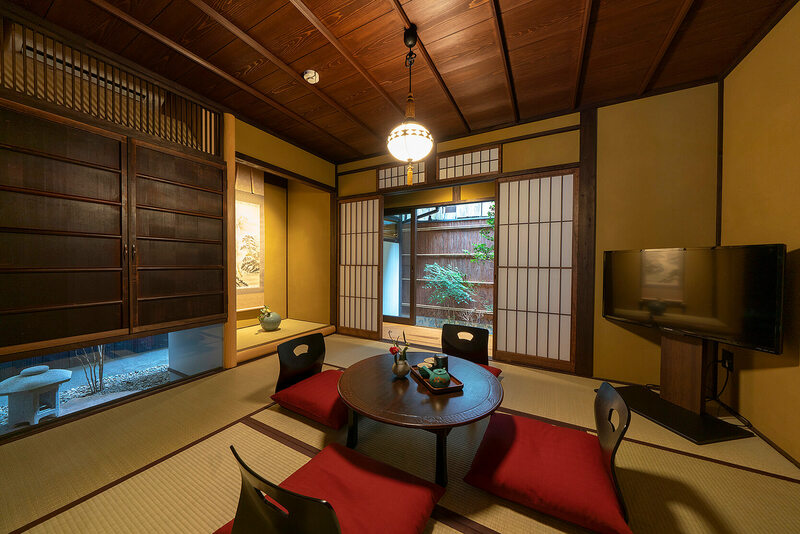 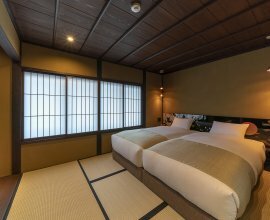 Experience ochaya teahouses, kaiseki fine cuisine, kabuki theatre and more in Gion, Kyoto’s historical geiko district. 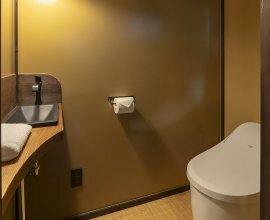 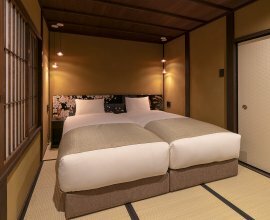 Enjoy convenient access from home - Gion is just 1 subway stop from Kiyomizu-Gojo Subway Station, a 11-minute walk from “Shakudo-an”.